The Dysart Law Firm, P.C. Burn injuries are some of the most painful injuries that can be sustained. Typically, they result in excruciating pain, not only at the time of the injury, but often through painful rehabilitation and subsequent surgery, which can include skin grafts and significant reconstructive surgery. A big part of a burn injury legal claim is understanding the complete scope of your injuries and the impact that they have on your life and the lives of your family. This often includes retaining fire experts, physicians, psychologists, economic experts, and other professionals to help establish the cases for liability and damages for our clients. Many severe burn cases require ongoing surgeries, rehabilitation, and psychological treatment. After the wounds are healed, scarring and disfigurement may interfere with movement, performing daily functions, and one's self-esteem. For many, the effects of a serious burn injury will last a lifetime. This is why it is especially important to develop a strong case for the future damages which may be incurred. We have had significant experience in representing those who have had severe and permanent life-altering injuries. We have recovered millions of dollars for these clients, including a settlement of more than $39 million for one case in 2011, and a verdict of more than $18 million in another case. Who is the Best Lawyer for My Burn Injury Case? How Long does a Burn Injury Lawsuit Take? Who is Responsible for My Apartment Fire? Can I Recover if Firefighter Equipment was Defective? How Much can I Recover for Being Injured in a Refinery Explosion? How is Pain and Suffering Calculated for Burn Injuries? What Damages can Be Recovered for a Fire? What Damages can I Get if My House was Burned Due to Someone Else’s Fault? How much can a wife and children recover if a husband died in a fire or explosion? Who May be Liable for a Nightclub Fire? Who is Responsible for Natural Gasoline Explosions and Fires? I endorse this lawyer. I have known Chris since I was a very young lawyer and worked for a law firm on the same floor as his firm. I have observed him in court as well. If you are looking for a personal injury lawyer, he is a good one. I like working with The Dysart Law firm, they are nice people. Positive result with my lawsuit, happy with outcome. I think they definitely took the time to talk with me, always there to answer any questions I had. Really helpful, always took my calls. Always felt important, despite the fact that my case was small compared to their other cases, they never let me feel that way. I’d have no reservations in referring The Dysart Law Firm to people, they are good people to work with, period. Chris has a remarkable background litigation background – both with the federal government and in private practice. He also has a good grasp of the issues facing lawyers in today’s market. I strongly endorse Chris for anyone needing the services of a skilled litigator. Another attorney recommended The Dysart Law Firm for our case so I knew we were getting a very good attorney, but Chris and his group went above and beyond. They were endlessly patient, responsive and just a pleasure to work with. They worked hard for my father and I will forever be grateful. I would recommend The Dysart Law Firm with the utmost confidence. Chris is a brilliant attorney who works tirelessly for his clients. An old friend, who is now deceased, referred me to Chris Dysart and I want to return the favor by referring Chris to anyone who needs an attorney. His staff was friendly and attentive and I want to thank them so much for helping me with my case. I endorse Christopher. He is a highly skilled attorney that is well respected in the legal community. I benefited very well from the monetary payoff by using Dysart Law Firm. If someone asked I’d say go ahead and use Dysart Law Firm. I highly recommend them. Chris kept me in the loop and calm and always let me know that things are going to be taken care of. I was stunned and happy (with the settlement)…and that everything worked out. The Dysart Law Firm experience was fantastic. They did what they said they was going to do. I’m very happy with my decision to use Dysart Law Firm. I’d tell anyone to call Dysart Law Firm in a heartbeat. It’s a great firm and I am thankful for them. Several hip implants have been subject to recall over the last few years and many lawsuits have been filed on behalf of those who have suffered from a defective hip implant. Find out today if you are eligible for compensation. We will help you understand your rights, so you can make the best decision possible. We will keep you informed from the first phone call to settlement. Defective Hip Implant litigation is serious, medical device manufacturers have the resources to defend themselves. A lawsuit is often necessary to maximize the settlement value of your case. 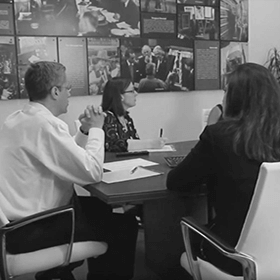 For almost 30 years, I have been a practicing trial attorney representing individuals just like you against some of the largest corporations in the world. I started my career as a law clerk for a Justice on the Missouri Supreme Court and went on to practice for the Commercial Litigation Branch of the Justice Department. I have also served as an Assistant U.S. Attorney acting as a federal prosecutor. In 1998 I opened The Dysart Law Firm P.C. to assist clients in Metropolitan St. Louis, Southern Illinois and nationwide. Benzene litigation is serious big manufacturing companies have known benzene's danger for decades, and have tried to cover it up. We know how to fight back. We've fought and won benzene cases for years. Are medical bills piling up? Are you out of work due to your illness? A serious illness can have a devastating impact on your financial circumstances. Let us help you get the compensation you deserve. You May Be at Risk for Benzene Exposure. What You Need to Know. Man that Contracted Acute Lymphoblastic Leukemia due to Toxic Chemical Exposure. This is Attorney Advertising. This web site is designed for general information only. The information presented at this site should not be construed to be formal legal advice nor the formation of a lawyer/client relationship. Nothing on this site should be taken as legal advice for any individual case or situation. The choice of a lawyer is an important decision and should not be based solely upon advertisements. Past results afford no guarantee of future results. Every case is different and must be judged on its own merits. Submission of information to us through this contact form does not create an attorney-client relationship, so please do not submit any confidential information. if we are to serve as your attorneys, all fees and the nature of your representation will be set forth in a written agreement.